You never know what is on the desk of a designer because he is always topped up with pressure and tasks to be done in the office platform, he never feels free or even if it is, he would be mentally occupied with ideas. Designers are always implying their ideas with imagination because it is said, when your intelligence is at work it can only drive you from A to Z but your imagination can take you anywhere and everywhere. So the best way out for an artist is to get his innovative ideas and fanciful thoughts in to place. In this way better prospects will come about. Creativity runs in the blood of a designer and he always wishes not to succumb to stress or tension. Because obviously when the setting is tensed it is hard to come out with something productive. The real problem lies when a designer is not flexible, he has to be nice enough to tackle with all the moods and demands of the clients. 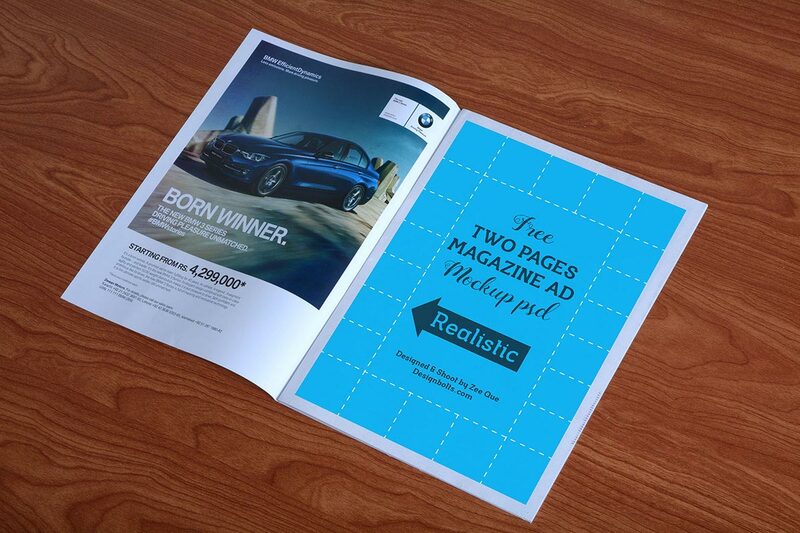 Today I am unfolding before you free high quality magazine Ad mockup PSD. You can use it freely if you are up to place an ad into magazine. Go for it, in your current or upcoming projects to show it off to your client straight away, it is an easy way to manifest how the ad will look in tangible form in a magazine, so the client will have a better idea about its whole look and appearance. Presentation is all that matters and it is the best way to get your design approved by the clients. If I say it speaks louder than words then it won’t be an exaggerated tone. Never put your efforts at stake, put a meaning and a complete sense backing your design so it would hardly get a disapproval or depreciative remarks. Stay hooked to us and we will keep bringing interesting posts for you all. Your feedback is always needed and makes us know which posts you are taking interest in. It is the best way to get connected to you by all possible means.